Over 80 gardens across the UK, from Perth to Bournemouth are opening their gates, lining up their spades and getting the kettle on to welcome new growers to take a look. The saying goes that ‘gardening adds years to your life and life to your years’ and on Saturday the 27th April you can drop in and meet people from your local community food garden. The Big Dig Day is organised by Sustain the food and farming charity that set up the Big Dig Network, to help gardens get more people growing food. They also run the London based Capital Growth network, one of the largest urban growing networks in the world. The gardens taking place range from large gardens such as The Regent’s Park allotment garden in London, urban farms and market gardens, community projects and schools. 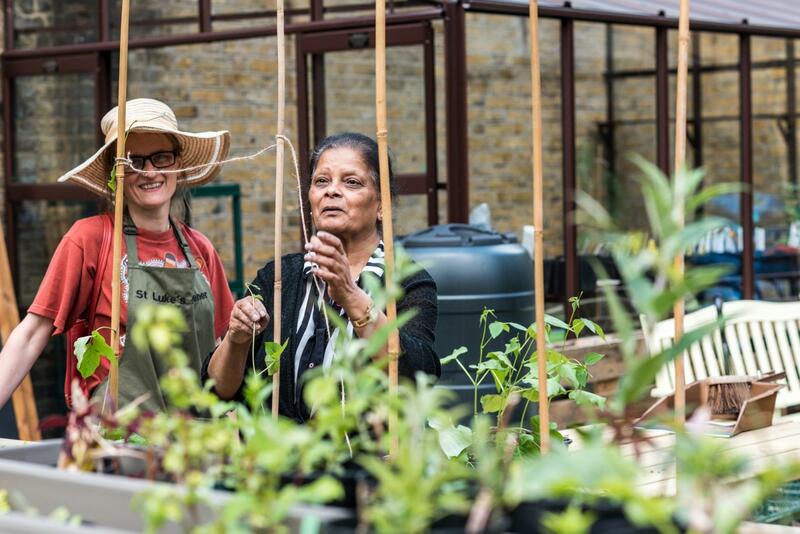 “We have been working with all sorts of community gardens for the last 10 years and see first-hand how they bring together people of across ages and walks of life, providing a real sense of calm and wellbeing” explained Sarah Williams, from Sustain who launched the Big Dig Day in 2012. Since then thousands of people have joined in at their local garden to grow healthy food together, building friendships along the way. The day, also being used to encourage people to eat more veg as part of the Veg Cities campaign, will be filled with family friendly activities, including planting and seed sowing, garden tours, family games and craft activities with the opportunity to create new wildlife-friendly edible gardens and to learn about permaculture and how to make plant feeds. The day is for all fitness levels, and for people looking to get regularly involved or those who may just want somewhere to relax. The Chalk Hills Academy in Luton helping retired community members share gardening skills with young people to grow their own food. There will be afternoon tea, children's activities, music and learn to grow your own sessions. Greenheart Growers in Glasgow - a Market Garden growing salad, herbs, and vegetables for sale to local cafes and restaurants, who will be building raised bed, sowing seedds, turning compost and planting herbs. Riverbank Community Garden in Manchester who will provide tours and a talk on beekeeping. Townsend Community Garden in Bournemouth for a day of planting, with sunflowers and beans for the children to plant and watch grow to giddy heights. The Old 1 O'Clock Club, South London where the Trees for Cities 'Edible Playgrounds' team will be deed sowing, planting out vegetable plus family games and crafts to encourage and wildlife. There are thousands of community groups meeting to grow together every week, and whether you want to grow, sow or just sit to enjoy the peace, you can find your nearest garden in a few clicks. The Big Dig Day is run by the food and farming charity, Sustain and is part of their Big Dig online platform that helps people to grow food together across the UK. Any community garden can register on the map for free and to date there are over 55 gardens on the map. The Big Dig Day is also part of the Sustainable Food Cities’ Veg Cities Campaign which is all about increasing the availability and consumption of vegetables in organisations ranging from schools and community groups to retailers and caterers. Photos and interviews with volunteers and garden leaders are available on request. Veg Cities: Veg Cities is a feature campaign of the Sustainable Food Cities led by food and farming charity Sustain in partnership with the wider Peas Please initiative led by the Food Foundation, Nourish Scotland, Food Cardiff and WWF.